After one game absence due to flu and food poisoning, Jeremy Lin should be ready to play in a home game against the visiting Boston Celtics. He does not appear in the injury list. The Hawks have Dewayne Dedmon listed as available. Trae Young and John Collins are listed as probable. Hawks have Dewayne Dedmon listed as available. Trae Young and John Collins are probable. Trae Probable? Is this a first? Trae, Collins are available to play. For Boston, no Hayward. Well at least today we will learn if the earth is flat. correlative or causal: if michael is awake then the earth is flat. NBA League Pass FREE TONIGHT. My TV Atlanta feed just switched out to the Boston feed. Ugh! Brian Scalabrine worse than Tommy Heinsohn, if that’s possible…. May have to go to tablet soon…. I am ok with Jeremy takes it easy tonight. No need to play hard just let the game come to him. Passed up a few shots and missed a 3, but good start for Lin. 1 steal, 1 rebound, 1 assist, and drew fouls in only 3 minutes played. agreed, they just missed wide open shots. I can’t stand LP subbing pattern..Why is Lin out of the damn game?? I can’t wait till Lin is out of there..At the very least, his next coach will allow the time for rhythm. what a crazy shot make from Kyrie damn! 3 min PT for Lin in 1Q?! Are we back to yo-yo minutes again? Guess no more “showcasing’ Lin. Also, home game tonight – meaning time for Young to shine! NO FOUL – phantom foul on lin. Hawks owning the Celtics on their back to back. Let’s see if they can keep it up throughout the game, especially 3rd Q.
Trae is 1 for 6. Ouch. Great passing as usual though. prince man another wide open miss. What happened to all the nice ball movement? Prince not helping Lin stats. How about some cutting and going to basket? 0 for 5 from 3. Prince is an awful brick layer now. His best attribute used to be his 3-point shot, but he can’t even make them. Ruined so many open shots that Lin and Trae have given him. Yeah, the earth is round not flat. Does he look like Albert Einstein? This game would be a blowout already if not for Kyrie having one of those games where you can’t stop him. Yeah the Celtics are Kyries team alright, it’s almost as if he is playing by himself. Rhythm off. Just 2nd or 3rd game back from injury? My problem with him is that he should stop if he doesn’t have it tonight. For those wondering about the TP Henson interview. Movie was shot in Atlanta and partly in Hawks arena. Also some cameos by Grant Hill, Jamie Gertz, & John Collins. Hope JLin’s 3’s start falling. Spellman has been shooting the 3 well lately…. Everyone shoots 3 now – “modern trend” of NBA. In Cleveland before Lebron went home his team was pretty bad. The reason was always his teammates fault, which was partially true. But now every single player who played extremely well on last years team has regressed since he and Hayward came back. Wonder why…. Lin taking practice 3s during halftime. Making most of them, even at the top of the arch, 18+ foot back. Tony Bennet of UVA head coach resembles Stevens so much in looks and both teams are doing so well. Problem is, he hesitates too much. Refs giving Kyrie superstar calls. That was a nasty step-back 3 from Huerter. Smart is such a dirty diver / flopper. LOL get ejected Smart. What a moron. Fine and suspend this piece of crap. Smart tried to injure Lin this season. Hope the league comes down hard on this trash dirty player. No sympathy for the dirty player! honestly bremby was just standing there. smart was gonna blow up at anyone. Excellent facilitation and nice short jumper to force timeout. Lin and his bench unit making things happen. Stopped the bleeding and got the lead back to 10. Great passing, rebounding, and defense by Lin. Love the Lin-Len connection. Lin clearly has a calming / stabilizing effect on his teammates! In a span of less than 2 minutes, 2 O rebund, 2 assist and 2 points. Geez, Trae with 5 turnovers. Heurter who are you passing to? Lin doing some real nice passing. next shot will be in! Lin’s shot was awful tonight, but he played well overall. Kyrie air balled it so I guess Brad Stevens is going to yank him. LOL, he is not Asian, your forgot? Lin passed very well but down crunch time missing open 3 blocked shot and half court shot. Pierce had enough ammo to take him out. Almost forgot that I’m Asian. Two good entry passes, but teammates didn’t convert, one nice drive but the refs didn’t give him free throws, miss a long three with the clock winding down YANK LIN! What a coach. so they will part with Lin without hesitation. Also part with LP first so he can go back to doing what he is good at. Development. no Trade news for Lin. hawks coach is a rookie. LP’s plan was to allow Lin to get the lead and let Trae come in and get the win, regardless. I’m glad Lin didn’t give them a higher lead. Lin was stopping Kyrie and LP was going to let Trae come back in anyways, but Lin has a shorter leash even though he kept the hawks in it or reduced the lead. LP just pulled him out because he can’t stand LIn making any mistakes ruining the chances for Trae to get a win. Now Len gets to experience the magic of Lin and how he helps the centers game getting deep passes in the paint for a rhythm shot. Have you guys found that Lin’s dribble today seemed more with confidence? Or it is just me? He looks like he’s worked on his dribble. Maybe in game situational dribbling exercise, like off pick n roll, his behind the back has improved. what ? no confidence you mean? not this game. ball was hitting his shoes all the time and seems to me that he was scared and was trying to pick the ball up. I thought I was the only one who noticed that..He looked more lively controlling/dribbling the ball. Hopefully, if Lin gets traded, his next coach will have a more conventional subbing pattern that would allow him to play through the beginning of the 2nd and 3nd quarter…..or not sub him out in the first quarter after bringing him in the 6th minute mark. 3s point shooting, creating space with dribbling, and taking off dribble and side step shots. No plain dribbling isn’t going to help! Lin need to mesh his dribbling drills with 3s. Look at what Curry does before every game, flashy dribbles before taking a 3. That goes for Dangelo Russell and most star players! Fans don’t care about defense only scoring unless it’s a championship team! Yet poor defense is a fake excuse to bench Lin! Lin’s defense has always been the top2 on his teams! So glad I’m not watching these games. Waste of time, limited plays and minutes, and Lin haven’t been shooting well. Oh well Lin will be traded before Feb deadline. These poor performances will keep Hawks from being greedy. They better if Lin the start and minutes if they want the most assets. Because of Kyrie the ball was a bit flat, hard to dribble. Sport, you seem like a good guy. I’m just really surprised, and really trying to understand. You’ve been faithfully following Lin all these years. But I don’t think I have seen any of your posts giving Lin any credit this year. None of Lin’s plays seem good enough. It’s been non-stop criticizing. Gotta do this better, gotta do that better. Lin’s 30, in his 9th year! If you expect him to be Kyrie Irving or Derrick Rose, you’ve been following the WRONG GUY. Many fans questioning Lin’s mindset. What is going on with your mindset? JLin with some beautiful passes! But, he’s been making bounce passes to the Hawks bigs. Collins and Len can handle up-top lobs. Especially Collins. And Lin is so good at throwing them! That’s what Nets fans used to say about Atkinson. Look what happened. Lin just doesn’t fit into their time-line. Hawks didn’t get Lin to make him a star over their draft picks. It is what it is. All the Asia promotion is obilgations with shoe contracts and connections. It’s earning money. That’s okay, isn’t it? He also wants to do charitable works there. Especially the basketball camps. It means a lot to him. EDIT – NEVER MIND, these numbers don’t add up, typo or not. Plays like this are a lot more fun. Lin unselfish. Good decision to pass to Huerter. Yes, agree! And Lin is good at that! And what was excuse from LP for taking him out in 3rd, after a fantastic LinnLen pnr run? Speed-of-Lin put together VERY NICE analysis of the Hawks’ using the “Hand-Off Pick-and-Roll” with JLin. JLin playing well out of it. Of course! JLIN’S BREAD AND BUTTER! Note at 2:00, Lin checking with Pierce for play-call. Len’s been playing really well. Works hard. Wish he would try passing the ball back out when he gets rebounds, instead of trying to go back up for a shot when surrounded. Other than that, he works hard. Has good hands for a big guy. Good chemistry with Lin. IF there is such a thing as an “ideal” situation for Lin at this stage of his career. To me, it would be similar to the role that Al Horford plays for the Celtics. Al Horford is 32, and getting paid $30M a year! Yet, somehow, I don’t think Horford is part of Boston’s long term plans. I would think the future is about Irving, Tatum, Jaylen Brown, Rozier, Hayward. They also don’t have anyone better at the 5. Baynes, Theis, that’s it. Horford may not be the main focus but he is a starter. And very much an integral part of their winning. He has the winning experience and talent, and helps the Celtics get buckets. Close out and win games. Given such success last season, the Celtics aren’t looking to regress and tank. They are win-now. I don’t know which team would be similar for Lin. Lin won’t be getting $30M. But, that’s the role that I hope he finds. Not questioning Lin’s mindset, just know this team isn’t going to keep him so why bother? 20mins and mostly told to pass because they want others to shoot. I understand that Lin can take more shots when “showcased” and has green light. Those games prove it’s not Lin but the GM and coach preventing him from shootjng more. But I’m not watching a 2hr game of Lin doing nothing and only playing 20mins. Highlights are enough. Being a fan doesn’t mean blindly praising Lin, he certainly has room for improvement and his lack 3 pointers and creating off dribble is an issue. Not as much as his basketball career. Lin did many Asia promotions last year with nothing to do with Adidas. And honestly if they want to make more money off of Lin they’d put “his” interest first and that means more time working on his skills. It wouldn’t surprise me if his body was not ready for 2 games in a row of extended minutes when he started against the Raptors. On top of that he took a few more charges to his body as well as an unsolicited “back rub” from an opponent. Always liked Rowan Atkinson tbh. Here are the numbers from basketball-reference. Trae is the upper set, Jeremy is below. Unlike Mavs, ATL does not have a smart coach, so they deserve loosing Luka and Lin , and stay at the bottom of the league. I am waiting to see Nets fail miserably. you mean his points suffers from passing too much? It gets complicated but I think the new CBAs, huge salaries thrown at top players, and attempt to give small market teams a chance to compete, and Sam Hinkie, may have pushed teams to do this whole tanking thing. And the NBA hasn’t done too much about it until this year. Well, not much we can do about it. I choose to still watch only because of Lin. Yup, hoping Nets fail big time! (And Hornets. And Rockets. LOL.) Unfortunately, Detroit and Washington are NOT cooperating so far. Not a fan of Rick Carlisle. Seems to me he’s part of that McHale mold. Actually, surprised he still has a job. 11 years with the Mavs. Only 6 playoffs and 1 championship. Donnie Nelson the GM got him Doncic. And the Mavs are still only 20 and 25. Yes, your post has the correct numbers!!! Yeah, I posted this tweet in the late hours. Because the guy was radio voice of the Celtics, I assumed credibility. Then saw the numbers and they didn’t look right. Didn’t have time to check. Now looking back at his tweet. “Real-time update”, maybe it was the numbers that he had DURING the game, before the game ended. Who knows, wasn’t clear. Sport, thanks for taking the time to reply. But, here’s the way I see it. It’s not a question of blindly praising Lin. LOL. The irony is that those of us who watch MORE than just HIGH-lights are probably even more aware of when Lin isn’t playing his best (such as turnovers). Or when teammates blow his assists. Or when Lin is not being played to his best. Sure, every player can improve, but not everyone has the same strengths and talents. Don’t you think he has already tried to do his best to improve what he can? How many summers have we seen him working on his 3’s? Marginally improving on what he ISN’T strong at, won’t make a difference in whether the NBA calls him a star. And Rondo? His problem was his lousy attitude with coaches and teammates. And constant injuries too, even if not the career-threatening kind. Talk about injury-prone. Yet, he’s not exactly out of the League. He’s playing with LeBron on the Lakers. How about Ricky Rubio? Also injury prone in his earlier years. Comparing this season. Lin has better shooting stats, in less minutes! Funny enough, the only better Rubio stat is ASSISTS! But, he’s still a starter on a playoffs contending team. Getting paid $15M. That’s why I never blame Lin. It’s not that Lin’s not good enough! As you already said, it’s NBA politics working against him! Lin’s NOT perfect. The so-called “superstars” aren’t either. So, I don’t expect Lin to be. To me, it’s more about focusing on the positive, instead of the negative. And at the end of the day, if Lin can’t go any further by playing HIS WAY, I can accept it. He would have already accomplished more than most players. Especially as an Asian-American in the NBA. Here’s another video, from the Celtics perspective. Marcus Smart, Mr. Tough Guy. Another Patrick Beverley. NBA entertainment. YES – AGREE! Lin’s defense always unfairly UNDER-RATED. “The way it used to be done”. You must be old like me! Alex Len is a beast with hops. A guy that big that can set monster picks, roll to the rim and finish with authority. It just goes to show how good talent needs to be brought out. I wonder how many good players never made it because of dumb coaching and FO objectives. I said I would like to see Jlin in TOR, and if possible Dedmon because of expiring contract. But I only said Dedmon because I did not think Len could be in the equation. 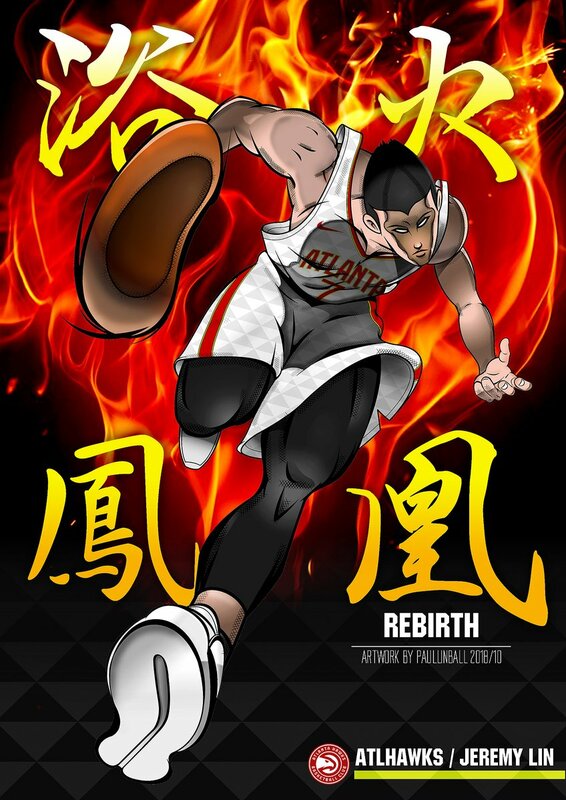 I believe if Jlin and Len went to TOR…holy smokes! You think Adidas needs Lin to make money? With how the Chinese fans go nuts over ANY NBA player? Hate to say it, but I think Lin needs Adidas more. These promotions are mutually agreed on. There are contracts, that Lin knowingly signed up for. The only promotion I can think of, which may have been non-voluntary, was the JR.NBA thing. Lin has many other ventures now. And even NON-Basketball (Esports.) He’s also promoting those interests. Yes, it’s true that he loves to play basketball. So, I think LIN KNOWS WHAT’S BEST FOR HIS CAREER. Google is your friend…that secretly spies on you and collects information. nope, I hope not. The problem here is that once Rondo and Lonzo comes back, Lin would be relegated to third string PG. Yup, I’ll probably see Mr. Bean ads popping up soon. Well, what am I going to do? Go live in a cave? Or, escape by sleeping a lot? Haha. I know I’m being choosy on behalf of Lin, but, no, no thanks. Play with LeBron? Rondo? No credit for winning but scape-goat if lose? Luckily, there will probably be no chance anyway. Wizards (another rumored team for Lin) using roster spot to sign guard Gary Payton II to a 10-day contract. NOT that I want Lin to go to Wizards. But, another case of Anyone But Lin? Oh, sure. Lin ranks way up there with all the “big” names. But, noooooo, Lin is just good enough to be “backup”. Or mishandle the ball and turn it over. If Prince could just play within himself. Use his athleticism, cut, get to the rim instead. He’s pretty good with that. Stop chucking 3’s if he doesn’t have it. But who knows, maybe that’s how LP wants Prince to play. Also, Prince is not a good defender. Maybe one-on-one, because of his length. But ball watches a lot, terrible court awareness on defense. Sharing minutes with him probably hurts everybody’s +/-. Including Lin’s. Haha. Based on what you’ve been saying, have to say I’m probably “some” years younger. But, all due respect to you Ace! “Old” is a relative term. We’re all OLDER than somebody. LOL. I prefer to think of it as MATURE AND WISE. I think the Mavs really wanted Doncic. Because they already had Dennis Smith as a point guard. They never wanted TY. That’s why they were willing to give up a first round pick to the Hawks to trade for Doncic. Donnie Nelson liked Lin though. He gave Lin the Summer League invite for Dallas. We’ll see! 18 more days! Is it possible that JLin is a tiny bit dated? The reference sport made that modern NBA ball is based around the 3 pointer and I would agree with that. It excites the crowd similar to an extra base hit in baseball. But longball is not Jlin’s game. His game is organizing the team on the floor into a cohesive unit and attacking the defense near the basket. When he is not doing that that means he does not have the ball in his hands in order to receive it beynfpd the 3 point line. Plus the modern “motion” offense also takes the ball out his hands more. His game is to control the game and to do that he has to be the primary ball handler, not one of 3 or 4. His primary skill set is a bit behind the times. Jlin has learned the other skills though, of an off guard. Contrary to what many think, I think JLin would prove to be an excellent 3 point shooter…if he chose to be (and ATL let him) But what he chooses, when he can is to run a team, rather than focusing on scoring points all the time. That’s why I think it best to go to a team that needs a floor organizer specifically because they have the other talent- a team like TOR. Ever notice that while he may have a bad scoring night his other play mitigates low scoring by great D or lots of assists. “Brooklyn”? Who are they trying to get rid of now? Some random fan? But looks like from Atlanta. Maybe money issues if his salary counts against a thin cap? ATL wants more than WAS can give? While it might be interesting to see JLin play with James it is hard to see JLin in LAL for some reason. For playing time for his next contract better IMO to play in WAS. WAS is another place that might bloom with Jlin’s talent as a primary- ball- handling PG. it is hard to imagine that they get a guy on a 10 day contract to be good enough to replace John Wall and help turn around the franchise. Don’t really watch football. But saw some tweets about bad calls or something from Rams/Saints game. Is Rodman paying respect to Jlin for being in the league or referring to a quote made by JLin? He’s referring to quote made by Lin. I forget exactly where or when. I think it was on twitter, Lin in response to someone (probably a hater) calling him “trash” or some stupid thing. Are you talking about this year, or next year? But Lakers not smart. Kupchak didn’t re-sign Lin. Houston part deux didn’t work. NYC part deux didn’t work. LeBron there doesn’t bother you? How about Rondo there? And Ball will be back? How about LA – but the Clippers? Not crazy about them either. Steve Ballmer from Harvard. But to me, Doc Rivers is horrible coach. Maybe if they got a new coach, and get rid of Beverley. Could be. Could be Lin has value playing for the Hawks. Only trade him if get a great return. Gary Payton II. Don’t know why he hasn’t stuck with any team. Good genes, no? Jae26hood video of Lin START in Toronto game. This is not just the highlights. But the plays that make up his stats. And including missed shots (FTs too) and missed assists. Good game from the Hawks. Too bad, lost a close one. “Jeremy Lin: Could Linsanity return to Los Angeles? The Lakers have been thin at the point guard position this season due to multiple injuries to Rondo, forcing head coach Luke Walton to use James, Brandon Ingram, Josh Hart, Lance Stephenson and even Svi Mykhailiuk to initiate the offense. Thus, it probably wouldn’t hurt to add another true point guard to the roster, and the veteran Lin would be a solid fill-in off the bench and also has an expiring contract that would make an easy swap with the aforementioned Caldwell-Pope. Lin has shown the ability to play shooting guard in spurts, which would come in handy in the event that he, Ball, and Rondo are all healthy at the same time. He’s a career 35 percent shooter from three, and while he plays an entirely different game compared to Caldwell-Pope, there would be some benefit to adding Lin to the roster. That is so cool! Dennis Rodman is a legend. Nets have zero stars and lackluster role players not surprised. Slap on the wrist and no suspension. This is why thugs will always be thugs in the NBA. seems he threw a punch which should be an automatic one game suspension. SMFH. 35k to them is nothing. It would be great if you are right! But I’m more pessimistic about Lin getting that chance, too much James worshipping. I don’t know, the Asian fans have disappointed me. Lin didn’t get that much support in Brooklyn. There was an Asian-America Lakers blogger/writer (Diamond Leung). Don’t remember him being all that supportive of Lin last time. Was still worshipping Kobe. Maybe I’m being unfair. MAGIC LOVED LINSANITY. And I remember he was tweeting welcome and compliments to Lin when Lin got traded there. So, you’re right. There’s hope there. Can never tell – anything’s possible!